Whether your engagement ring is made from gold, white gold or platinum, the best way to clean it is soap and water. Start by mixing very warm water and basic dish soap in a small bowl and let the ring soak for 20 to 40 minutes, depending on how dirty it is. If you need to wash away a substance such as lotion or makeup, use a very soft toothbrush to clear away residue, rinse the ring under warm running water and repeat if necessary. It’s important to rinse thoroughly to remove soap residue. Be careful with using other cleaners. Bleach and other harsh substances, and even some jewelry cleaners, can damage your ring. Look for non-abrasive, chemical free solutions. Another option that works on silver or gold rings involves using Windex and hydrogen peroxide. Mix a solution that’s half Windex, half hydrogen peroxide in a small bowl. Soak the thing for about 15 minutes. The Windex will get rid of any day-to-day dirt on the ring, while the hydrogen peroxide kills off bacteria. Remove the ring from the bowl, and gently scrub it with a soft toothbrush, then rinse in lukewarm water and let it dry. Have a solid silver ring? Mix a solution of ½ cup of white vinegar with two tablespoons of baking soda in a shallow bowl until the baking soda dissolves. Soak the ring in that solution for two to three hours, rinse it under cold water, and dry it with a soft cloth. Don’t have any white vinegar on hand? You can use ketchup instead. A quick – and we mean quick – dip into a small bowl of ketchup can remove tarnish from a silver ring. Use a soft toothbrush to get the ketchup into crevices, and then rinse the ring in lukewarm water and let it dry. Again, don’t let the ketchup on the ring for more than a few minutes. Thick creams and lotions can cause a residue build-up on your diamond engagement ring, which can at worst lead to discoloration or at the very least, make it look and feel dirty. If you know you’ll be doing something that could damage your ring – cooking, strenuous manual labor – take it off and put it in a safe place. If you have a ring with a warranty, keep on top of your maintenance appointments. Working with an expert can help you spot any damage or potential for trouble. And finally, the best advice we can give for cleaning a diamond ring – no matter what kind of ring you have – is to clean it on a regular basis. Routine maintenance will give your ring its shine and cut down on the time it will take to clean. Be thorough, yet gentle — intense brushing can loosen or damage gems – and you’ll have a ring that you’ll be even prouder to show off. If you still haven’t found that perfect diamond engagement ring, Doylestown Gold Exchange can help. 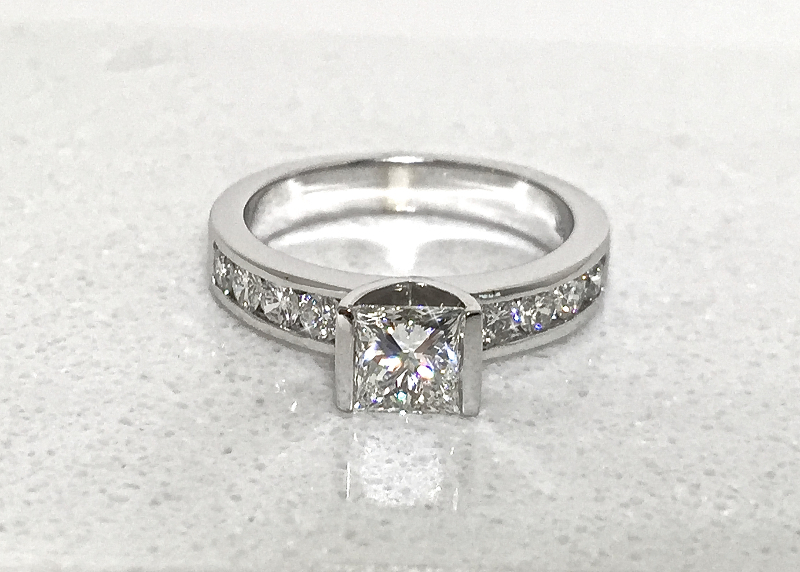 For 25 years, Bucks County diamond buyers have turned to use for our expertise and the quality of our selection. Visit us today to find a diamond engagement ring that’s right for your special someone.